The Adept Aluminium Framed Noticeboard is a superb entry level notice board, while still retaining high quality levels. This Framed Noticeboard is available with a cork board or felt fabric, available in a range of 11 colours. Four budget colours are available: Blue, Red, Green or Grey. This offer also includes the FireAdept Aluminium Framed Noticeboard. The Adept Aluminium Framed Noticeboard is a budget noticeboard that still retains high-quality levels. The Satin silver anodised aluminium frame had rounded safety corners and concealed corner fixings. The board is available in cork or 11 colours of felt fabric. The standard budget colours are Blue, Red, Green and Grey, and the custom colours available are Light Green, Gold, Lavender, Lilac, Light Blue, Orange and Plum. 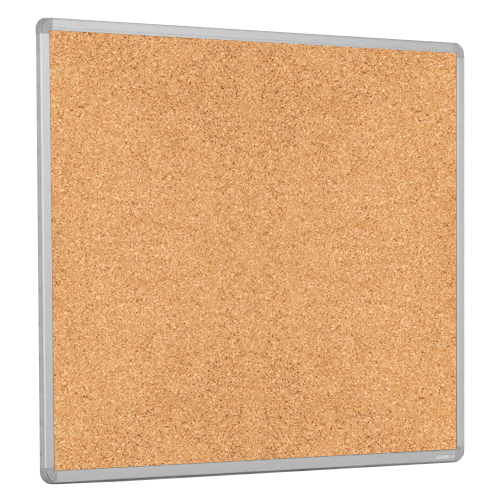 Both cork and felt surfaces are suitable for pins and staples. This Aluminium Framed noticeboard is suitable for portrait or landscape use, and wall fixings are included.